Place components for power, lighting, appliances etc. Place lines, notes, images, labels for clarity and guidance on site. Pricing and materials are calculated as the plan is compiled. User defined suite of Electrical Components with Custom Icons and Pricing. ‘Component Calculator’ to break down components into materials (cabling, switches, outlets etc) and time requirements.  Match supplier product codes to ElectroPlan Cost Items for cost and price calculations. Importation of plan images from architect’s PDF documents or graphics files to provide the floor plans for a project. 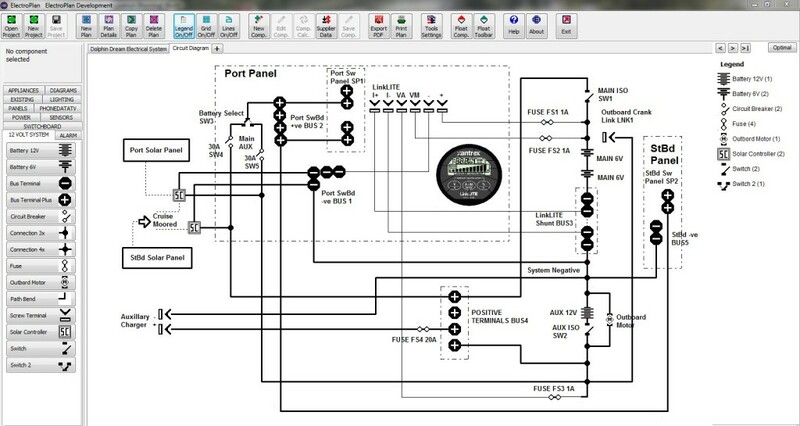 Electrical components are placed on plans at the locations required. Additional details are added to the plans with line drawing, rectangles, rectangles with text, text and images, logos etc. Circuits and activating switches shown with component-to-component line links. Lighting Circuit Counter to automatically set switches and adjust pricing and materials / time calculations. 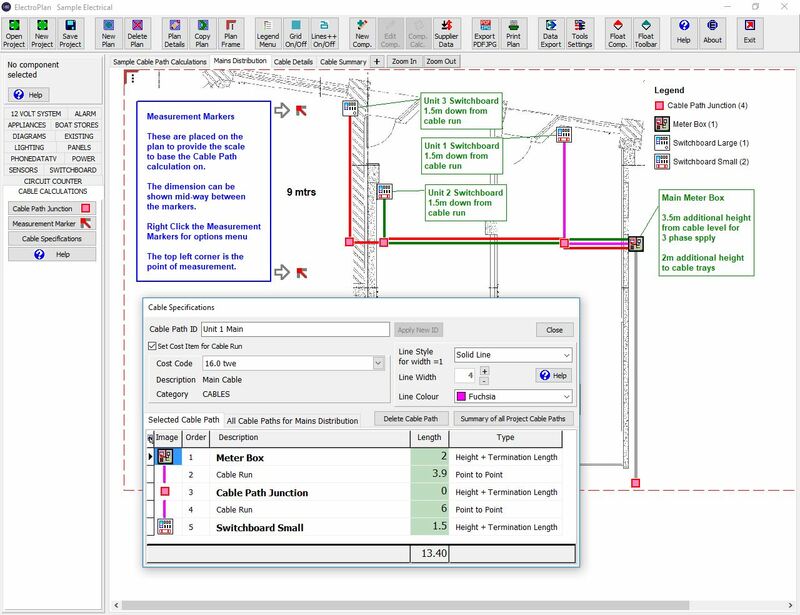 Cable Path Calculations – Calculate Cable Lengths and Costs on an plan with added dimension markers. Plan legend showing all components and number. Plan grid guide to assist with component alignment, giving a neat and orderly layout. Plan Frame selects the area of the plan to be exported. Import whole plans larger than screen size or a selected area. Copy function to create a new plan and move selected components. Refresh plan image to accommodate architectural changes. Have multiple plans in a single project. AutoSave in case of computer malfunction / power cuts. Recall projects for adjustments, additions etc. Import project details and plans into the current project from a previously saved project. Export the project as a Quote, Estimate, Invoice or Proposal in an email-ready PDF or JPG file. Data Export to enable ElectroPlan data to be imported into other software systems. Export the project as a Certificate of Compliance / Safety Certificate. Plan title block configuration options including logos. Quick Certificate of Compliance / Safety Certificate creation. On-line help accessed from within the application. Analysis of components and project costs. Materials and time breakdown for the whole project and plan by plan. Multiple plans with component legend. Save details by date of creation / variation. Catalogue Supplier download files containing price information. Costing and Pricing using data from Supplier Download Files. Sales Tax / VAT / GST calculations with configuration for Tax Exemptions. Full project documentation with client contact details, project notes, price, terms and conditions, acceptance sheet, certificate of compliance. Report of % price variations after Supplier Download processing. Price variations to give comparisons for the client. 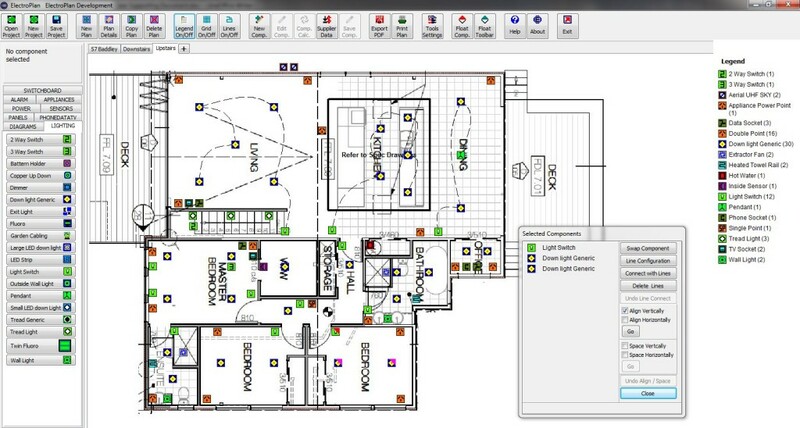 Import floor plans from architectural plans received as PDF files. Add Electrical Components as needed at the location required on the plan(s) – The total price and component count by plan and type is calculated and re-calculated by the system as the plan evolves. Prepare the Project Notes and Description of Work to add clarity and understanding to the project. Add any Additional Items needed for the job not covered by pre-built components. Export as Quote, Estimate, or Proposal for the Client as an email-ready PDF document. Revisions and Additions received from Client. Revise project with re-costing, re-calculating happening at the same time. Export the plans to a document to be taken on site on paper or a mobile device so that the job gets done with no mistakes and communications is crystal clear. Export Certificate of Compliance complete with detailed plans. Screenshots … click an image to see a larger view.